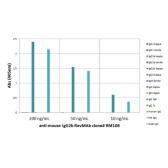 Specificity/Sensitivity: This antibody reacts to the Fc region of mouse IgG2a. No cross reactivity with mouse IgG1, IgG2b, IgG2c, IgG3, IgM, IgA, IgE, human IgG, or rat IgG. Specificity/Sensitivity: This antibody reacts to the Fc region of mouse IgG2b. 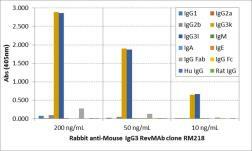 No cross reactivity with mouse IgG1, IgG2a, IgG3, IgM, IgA, IgE, human IgG, rat IgG, or goat IgG. Specificity/Sensitivity: This antibody reacts to the Fc region of all subclasses of mouse IgG. 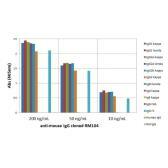 No cross reactivity with mouse IgM, IgA, IgE, human IgG, and rat IgG. It may cross react to goat IgG. Specificity/Sensitivity: This antibody reacts to the lamda light chain of mouse immunoglobulins. 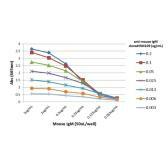 No cross reactivity with the kappa light chain, human IgG, rat IgG, or goat IgG. Specificity/Sensitivity: This antibody reacts to the Fc region of mouse IgG1. 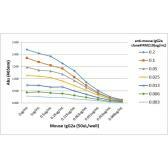 No cross reactivity with mouse IgG2a, IgG3, IgM, IgA, IgE, human IgG, or rat IgG. It may slightly cross react to mouse IgG2b, and may also react to goat IgG. 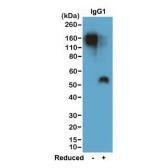 Specificity/Sensitivity: This antibody reacts to mouse IgM. No cross reactivity with mouse IgG1, IgG2a, IgG2b, IgG3, IgA, IgE, human IgG, rat IgG, or goat IgG. Specificity/Sensitivity: This antibody reacts to the Fab region of mouse IgG3. 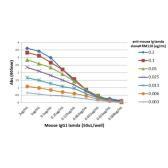 No cross reactivity with mouse IgG1, IgG2a, IgG2b, IgM, IgA, IgE, human IgG, or rat IgG.